With the dynamic technology changes, the complexity of projects that large organizations, enterprises, service providers, systems integrators deploy has increased. Such Projects or programs require a structured, disciplined and a well-staffed project Management office in place. PMO expertise not necessarily existing in such organizations and isn’t a common ingredient of its OD. ADVISORY, fills in the gap through providing a Project Management Office as a Service or (PMOaaS). Having PMO as a service allows organizations to ensure leveraging the intense expertise of ADVISORY in such arena and just monitor engagement progress and KPIs. ADVISORY has been delivering this service – as part of its project management consultancy portfolio – for the past 10 years with a great success track record. Clients’ feedback has been impressive. Between the onsite delivery and back office support, ADVISORY provides a comprehensive and rich clients’ experience. The multi-level reporting, progress dashboards from ADVISORY PMOaaS puts organizations management and executives to peace of mind since they can access it from anywhere at any time. Explore all existing projects details which includes but not limited to scope, budget, issues, Quality, schedule, risks and current status. Build a comprehensive Dashboard (BASELINE). Based on Explore phase and Strategy phase, PMO will build a per project plan and a collective plan and feed all information into the Progress and Control Dashboard. Management Workshop to understand the organizational strategy and identify projects priorities and interrelations, dependencies among all projects. 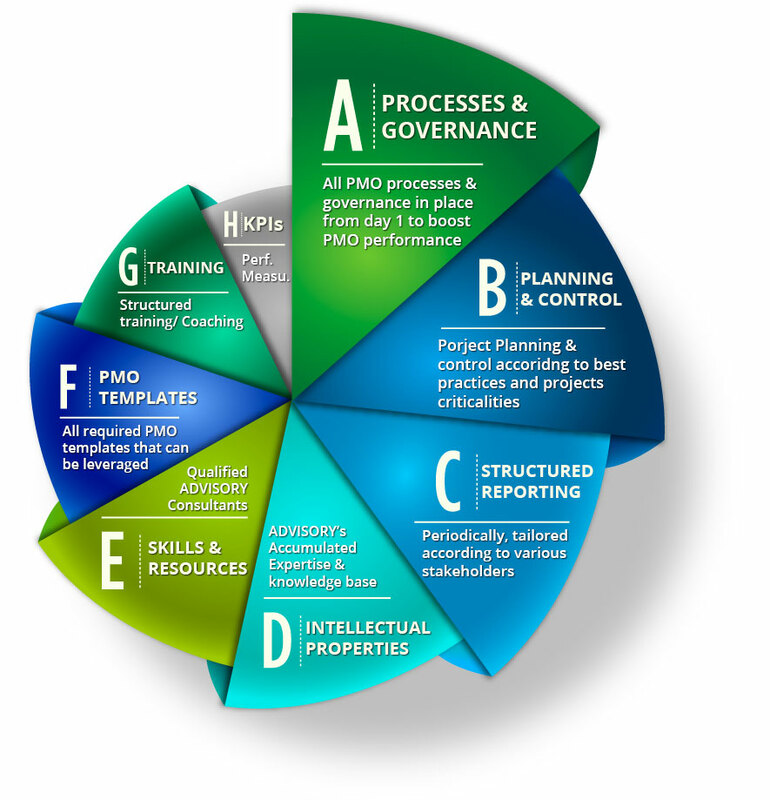 Coaching and training is another added value of PMOaaS for any organizations’ Project Managers. The PMO setup and documentation at the end of the engagement can be recycled by the internal team to keep the engine running. PMO is built with ADVISORY Project Management Consultants , but existing Organizations’ Project Managers can be leveraged as well. PMO relies on ADVISORY’s BACKOFFICE processes, governance, intellectual properties and PM disciplines. PMO will execute the plan and start reporting internally and externally, a quarterly management review will be conducted as well to discuss progress. ADVISORY relies on the wealth of its BACK OFFICE Support to all established KPIs of the services. PMO governance, Organization Structure, discipline, methodology, documentation and templates are accessed and leveraged by ADVISORY Consultants through the engagement to ensure a properly built PMO.